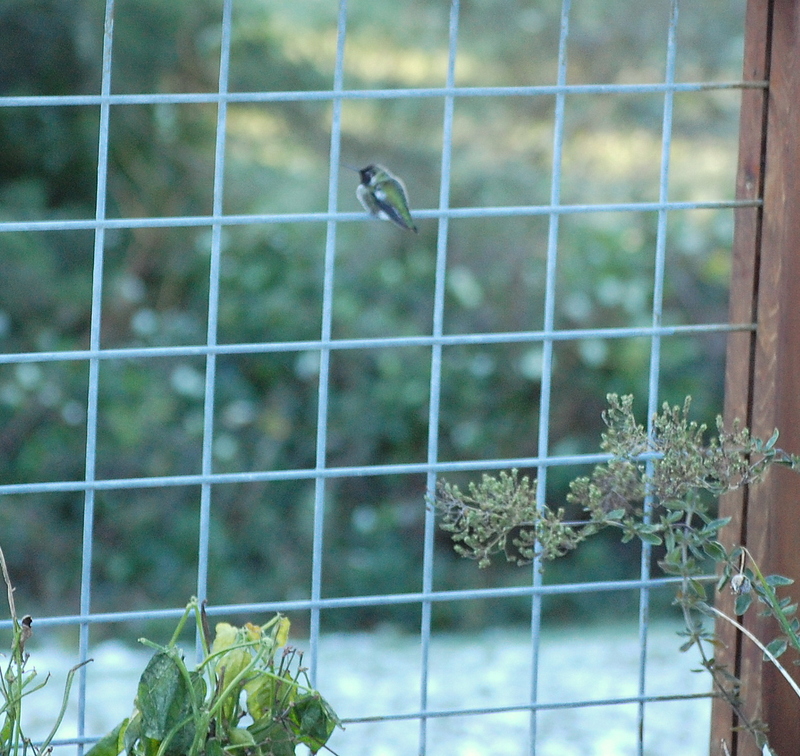 We still have Hummingbirds, and since I figured you wouldn’t believe me, I took photographs to prove it — lousy photographs, but photographs nonetheless. I took this shot through the dining room window. That white stuff you see on the roof behind the bird is snow. I have three Hummingbird feeders but only one is out for the winter. During our cold snap I had to switch the bottles out every half-hour to 45 minutes to keep the syrup from freezing. Amoeba calls this fellow pictured above “Dog”, as in Dog-in-the-manger, because he perches on the feeder and won’t let the others come near it. That only works for awhile though, and then one will get brave enough to challenge him and manage a drink. This isn’t a very good shot, either. I guess it is hard to take a decent photo when one is shivering. Here you see the Hummingbird on the porch rail in what is left of my herb garden. Beyond him you can see white snow on the lawn. UPDATE: Kelley (Southlakes Mom) sent me a link to a great National WildLife article: The Humingbirds of Winter. Beautiful contrast of hummers in snow. There’s a really good article about winter hummingbirds in the NWF magazine this month. 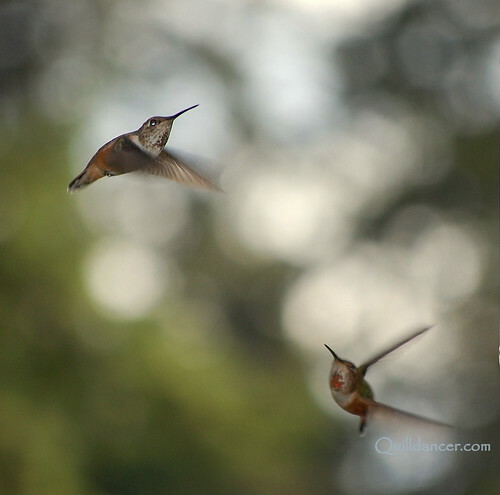 These are, in fact, Anna’s Hummingbirds (Calyptra anna). They’re now year-round residents of the San Juan Islands. When the feeder first went up, last spring, the Anna’s were greatly outnumbered by the Rufous Hummingbirds (Selasphorus rufus, a close relative), but those birds were pretty much gone south by the end of September. We sometimes go days without seeing any hummers, but since the snow fell, it’s rare not to see them. I have to presume that they find enough insects to keep then going through the no-flowers season. I found you from Dona Nobis Pacem. I love your site. I’m going to poke around a little bit, but don’t worry I’ll put everything back where I found it!! Kate — take things apart to your heart’s content. I have noticed that WordPress blogs tend to be nicely self-cleaning! Oh wow! That is so cool! You have very good eyes to spot them and take a photo. I’m always too slow. Kay — they are around so often it is rather hard to not spot them. One just has to grab the camera and wait. Did you see the pic I got this Summer? I have never seen these little birdies flying free in gardens. I only know them from the zoo. They are so cute and so little, it’s really unbelievable ! Gattina – -it makes me sad to think of them in a zoo. they should be free! That’s so neat. I bought a hummingbird feeder but haven’t put it up and was planning to next spring. I want to see if I can get it withing sight of my kitchen window.At our old house I was very surprised once to see one flutter around the hanging plants for several seconds before moving on, but I never did get the feeder up to try to attract him back. I am hoping there are some in our new area. WOW, makes you want to gather them in your hands and get them warm. My Mom collects hummingbird everything. I may have to take pics Christmas and write a post about it. It’s hard to buy anymore for her because she has so many we don’t know what she has anymre. Sweet things! I can´t believe they stay for the winter. Amazing! Our hummingbirds left about a month ago. I kept the feeder out a little longer, hoping to see one of them again, but they are definitely gone until Spring. I had no idea your area had them year ’round! Happy Thanksgiving — such a bountiful post! 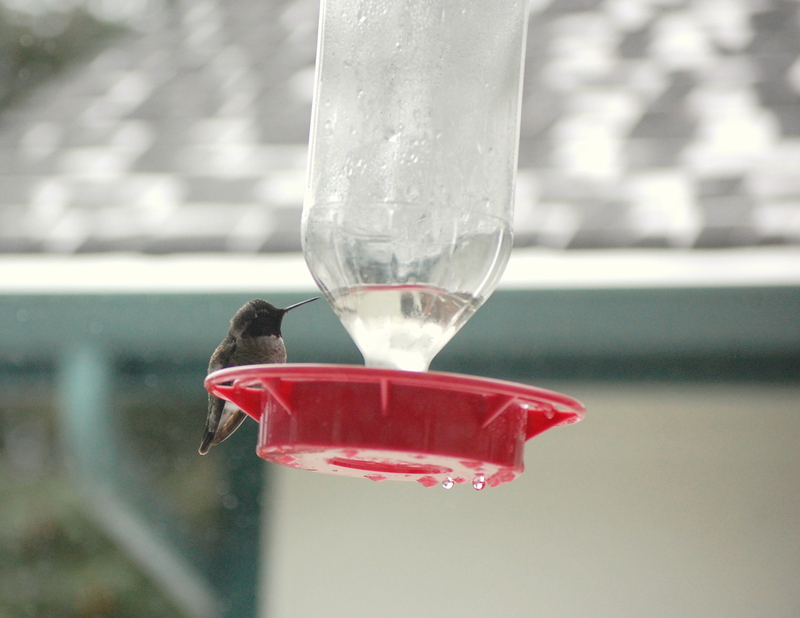 It’s filled to the brim with hummingbirds — but I think you shot “The Dance of the Hummingbird” in late Spring.